Four days after the North Korean Politburo stripped Jang Song Thaek, Kim Jong Un’s foremost mentor and protector, of all his posts and ranks, a special military tribunal of the DPRK Ministry of State Security convicted him of attempting to overthrow the state and to replace the people’s power and socialist system with his own personal rule with the help of hostile foreign forces, and executed him immediately. Kim’s decision to publicly humiliate and execute his own uncle-in-law surprised me because it came in sharp contrast with the practice established by Kim Il Sung and Kim Jong Il who had only purged and exiled the relatives they deemed threatening. Jang’s demise not only provides more clues that should lead to a reevaluation of the post Kim Jong Il era, but also, on a more practical level, demonstrates Kim Jong Un’s willingness to fight to the death to stay in power and the need for the United States and the international community to take the threat of a nuclear-armed North Korea more seriously. First, in a bid to form a group of loyal followers who would owe their lives to him and whom he could use for toppling the leadership of the party and the state, Jang freed “the undesirable and alien elements, including those who had been dismissed and relieved of their posts after being severely punished for disobeying the instructions of Kim Jong Il and “let them work in the WPK CC Administrative Department and organs under it in a crafty manner.” Now we have an official explanation as to who was behind the nationwide amnesty in January 2012 and subsequent concentration camp closures and prisoner releases from the North Korean gulag supervised by Jang. Since most of the political prisoners freed at that time are now deemed as Jang’s factionists, most of them are likely to be returned to jail again. Second, Jang was accused of doing “serious harm to the youth movement in the DPRK, being part of the group of renegades and traitors in the field of youth work bribed by the enemies.” This admission is startling because it recognizes the existence of the “youth problem” in the country and accuses Jang of seeking to use them as a shock brigade in his own power bid like reformers in the Middle East during the Arab Spring. Now it is understandable why in the past year the Rodong Sinmun published several major articles discussing the difficulties in addressing the “youth problem” in various countries. It was almost certainly Choe Ryong Hae, who was the party-appointed shepherd of the North Korean youth for over a decade, who linked Jang, his former boss responsible for party guidance over the youth movement, to this crime. Third, according to the trial documents, over the past two years Jang worked hard to put all affairs of the country under his control, massively increasing the staff of the Administrative Department and organs under it, “stretching his tentacles to all ministries and national institutions.” Jang was accused of converting his department into a “little kingdom which no one dares touch.” No wonder that Kim Jong Un decided to disband the Administrative Department after Jang’s purge. Fourth, the trial materials show that the Politburo members resented the fact that Jang “systematically denied the party line and policies, its organizational will,” in the past two years. He acted as if he were “a special being who could overrule either issues decided by the party or its line.” Jang established his own unified guidance system, which forced his department and all relevant organs “to consider what he said as more important than the party’s policies,” even at the expense of “disobeying the order of the Supreme Commander of the KPA.” In essence, it is saying that the existence of Jang’s line of controlling authority undermined Kim Jong Un’s unified guidance system and impeded his consolidation of power. Sixth, in an interesting accusation, Jang’s trial materials confirmed his campaign “to put all major economic fields of the country under the control of his department in a bid to disable the Cabinet,” or, in other words, to build his private cabinet above the Cabinet. He allegedly sought to accumulate material resources to be used in financing his power takeover bid while driving the economy of the country and people’s living into an uncontrollable catastrophe. That, in turn, would push the army and the people to call upon him to assume the premiership and come to the rescue as the visionary reformist Premier supported by the international community. Now we know why the party’s “pivot to the Cabinet” failed to produce any meaningful economic results: according to KCNA, Jang hijacked the Cabinet machinery and exploited it to his own benefit. In short, the regime is pinning all economic failures on Jang and his faction, insisting that the Kim dynasty simply did not know what he was doing and why. Now they say that Jang betrayed their trust and must be held responsible for the botched currency denomination reform in November 2009, which the regime admits as a policy failure and characterizes as the “reckless issue of hundreds of billions of won sparking off serious economic chaos and disturbing the people’s mindset.” Jang is also blamed for stealing funds and materials from capital construction in Pyongyang, held responsible for the country’s “huge foreign debts,” accused of selling off coal and other precious resources indiscriminately for little money and for selling off the Rason economic and trade zone to China for 50 years “under the pretext of paying those debts,” as well as for stashing away considerable funds and precious metals in secret bank accounts overseas so he could use them to fund his military coup. Finally, in his court testimony, Jang said, “I was going to stage the coup by using army officers who had close ties with me or by mobilizing armed forces under the control of my confidants.” So it seems Kim Jong Un eliminated Jang Song Thaek because his confidants convinced him that Jang was planning to stage a military coup. It also explains the relentless purges within the KPA top brass in the past two years which now seem to have been designed to remove any Jang followers or sympathizers and put in commanding posts only the army officers loyal personally to Kim. We will never know whether Jang dreamed about becoming North Korea’s “Great Reformer” comparable to Deng Xiaoping or Gorbachev. But we now know for sure that the Kim regime is afraid of the emergence of a renegade insider who may attempt to take advantage of the North’s economic problems and the people’s yearning for a better life to seize power with military backing and get quick recognition from foreign governments. This prospect keeps Kim Jong Un awake at night. It scared the ruling elite in Pyongyang so much that they came to regard Jang and his faction as a mortal threat to their rule. Hence, in order to ensure their long-term survival, the overwhelming majority of the party, state, and military elites backed Kim’s move against Jang. Second, and more importantly, Jang’s saga forces impartial observers to rethink the history of post-Kim Jong Il political development in the DPRK because the regime’s narrative is so straightforward, detailed and transparent. One can question its veracity, but it is so different from the regime’s previous mantra and so damaging to its propaganda about the rock-solid leadership unity and succession accomplishments that it is hard to explain why Pyongyang would want to publish such a controversial account unless it was close to the truth and reflected the victor’s justice. We can draw conclusions from Jang’s execution on other important issues. First, we still know very little about Kim Jong Un himself. Jang lost his power and life because he underestimated Kim. He saw the purge coming, but failed to act. It shows that we still know very little about his motives, fears, and his internal brakes. But the execution has demonstrated to his people and the outside world that he should not be underestimated, particularly his determination to preserve his absolute power. Second, the fact that Kim authorized capital punishment for his aunt’s husband suggests that Kim Kyong Hui probably has lost all her political influence and personal standing with her nephew and his family. Third, the execution proves that even the Chinese know very little about Kim Jong Un and his regime because Beijing, too, failed to see it coming. With “China’s man in Pyongyang” publicly humiliated and executed, Beijing lost a trusted channel and a key control lever in North Korea. It should also give pause in Washington to those advocating that the US essentially outsource it North Korea policy to China, an approach that hasn’t worked in the past and is sure to fail in the future. Given these unsettling developments and the continuing danger posed by a North Korea armed with an increasingly capable nuclear arsenal as well as able to launch at a moments notice conventional provocations against South Korea, the United States and its allies must stop underestimating the threat posed by Pyongyang. It is no surprise that the special military tribunal that tried Jang accused Washington and Seoul of masterminding Jang’s crimes, bluntly stating that Jang was “a tool of the “strategic patience” policy and “waiting strategy” of the US and the “south Korean puppet group of traitors.” A new more robust and pro-active US response addressing the rising challenge of a stronger, more assertive North Korea is needed. “N. Korean leader’s uncle not personally affected by dismissal: policymaker,” Yonhap, December 4, 2013, http://english.yonhapnews.co.kr/national/2013/12/04/92/0301000000AEN20131204008400315F.html. “Traitor Jang Song Thaek Executed,” KCNA, December 13, 2013. 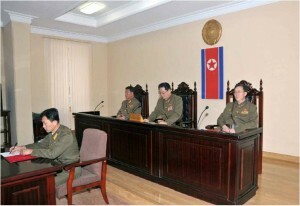 “Meeting of WPK CC Political Bureau Held,” KCNA, December 31, 2011.